Any votes for a smaller 36mm Version D? C does look really well balanced. Tweaking finished and moving to production. Can I ask, what are the main differences between this model and the previous one ? Sapphire and the other day on the FB page there were two different dials shown he was deciding on. The FB page has more info on all the new releases. That prototype looks lovely and the ultra subtle Everest font is perfect. Love it, can’t wait to get my hands on one when they are released. Eddie, I have been on a hunt for an used PRS-25. Saw a few of them recently for sale on different forums. Do you have a target release date for this version? Hopefully September but that's not a promise. Ok its August....Eddie i'm gonna bug you for an update on PRS 25 please. I'd like to know what the final 'tweaks' were too please. Specs as original with the addition of a saphire crystal. I hope not. 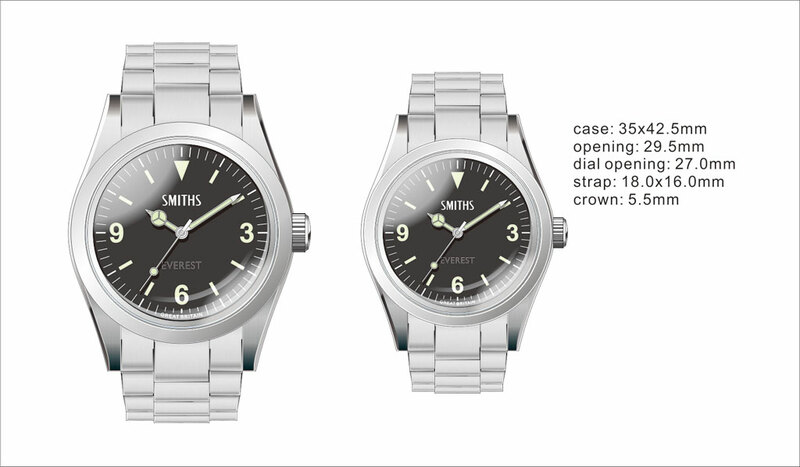 I thought both the dial and the hand set have been altered :the minute markers reduced,the hands longer and the SMITHS slightly reduced? I was wondering if the new 25 would come back into my collection with the design tweaks, but a smaller size 25 would be a necessity! Why are you thinking about 35mm? Why not the classic 36mm? Eddie any idea for pricing of the bigger one due in September? 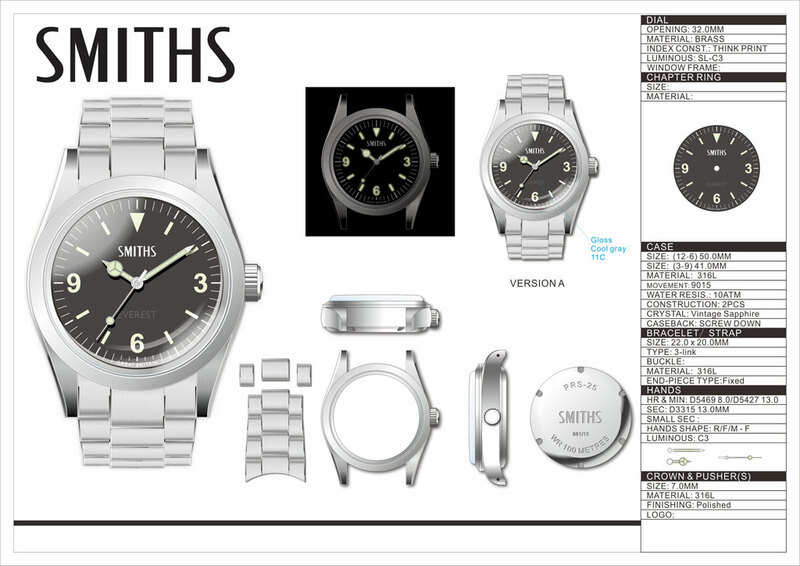 Im thinking of buying another watch and want to make sure i have funds available for yours if i like the final result. Last edited by Faide; 10th August 2018 at 15:21. ^^ That proves the 35mm question! I still think that the 35mm handset, could do with being enlarged. So that the minute hand hits the minute track plus it gives the overall set a bit more weight too. I have mocked up: Larger hands on the left, Eddie's original on the right! The smaller version looks spot on Eddie. The only thing that I personally would change is the lug width, I'd be happier with 20mm. wow i did not know that the older explorers were 35.19mm. But here's another question. Why have a 18mm bracelet. I just checked my friend's 1016 and he has 20mm lug width. And again very important. If you are just "thinking" about this what is possible ETA on this? Christmas this year or a 2019 thing? 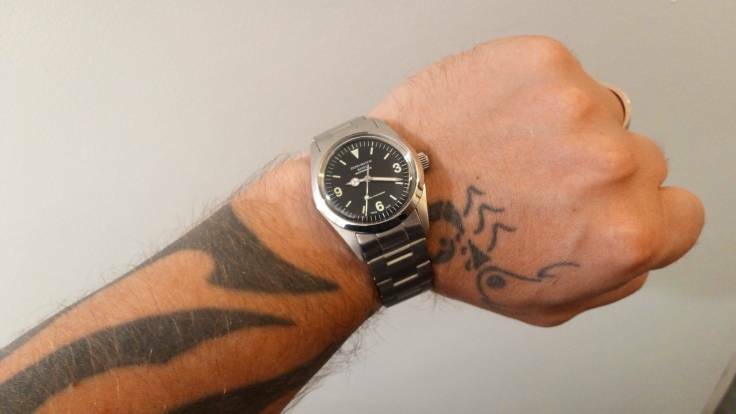 20mm lugs would ruin the proportions of that watch. A proud owner of the PRS-1 and PRS-2. So yes a true believer. Whether this is a watch i will buy or not i know that it will be fantastic quality. Hint: if EDDIE makes a true 1016 homage with 20mm lugs and 35/36mm case. I will be trampling over everyone like its Black Friday at Walmart. 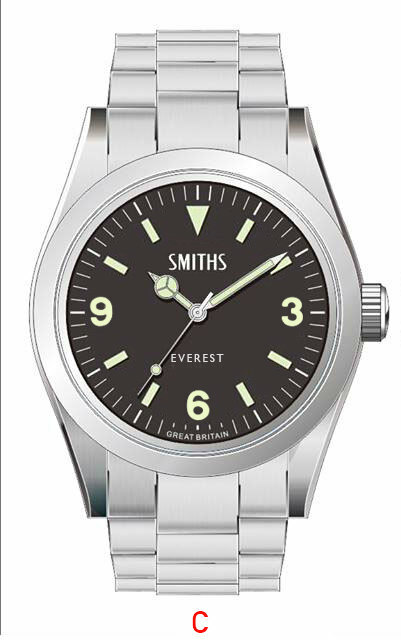 As Eddie can probably confirm, I've had my fair share of Everest's, lovely watches that are such great value for money. I'm currently wearing the 36mm Zeno Explorer, it's quite small for me at 36mm but i believe that the proportions of the 36mm case and 20mm lug width work much better together. And you soon get used to the size after a few hours wearing it. If the smaller Everest takes off I'll be all over that, just hope the lug distance can be changed to 20mm. Last edited by senraw; 10th August 2018 at 21:33. 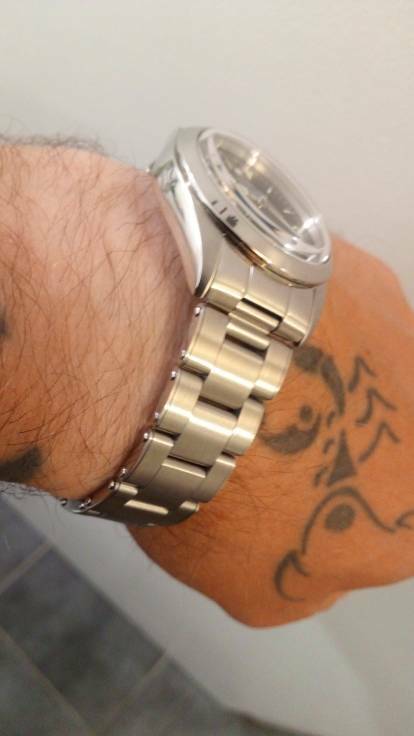 The 1016 rolex explorer had a 35.19mm case as eddie shows above and 20mm lugs and looks beautiful. So i dont think it ruins the proportions. We’re talking about the 36(35)mm now, you understand, right? I own an Everest , I understand perfectly which size is under discussion. Right? Me too. So you think 20mm lugs are out of proportion on a 36mm case? No. I know they are. But that's just my opinion, and also my final word on the subject. Apologies of course everyone is entitled to their opinion. 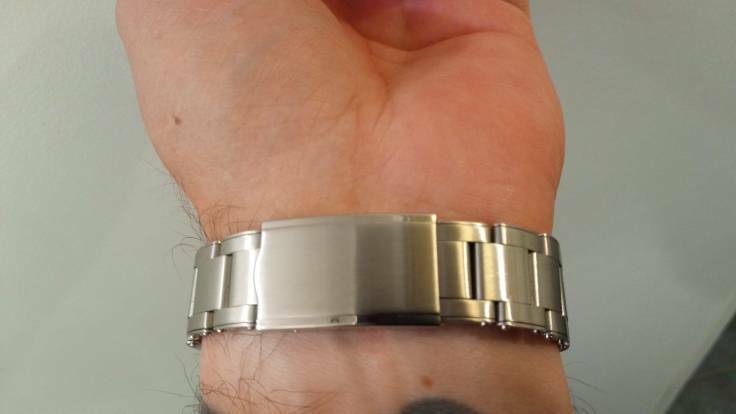 What we were pointing out is that the ORIGINAL Rolex Explorer 1016 had a 35.19mm case and 20mm lugs. 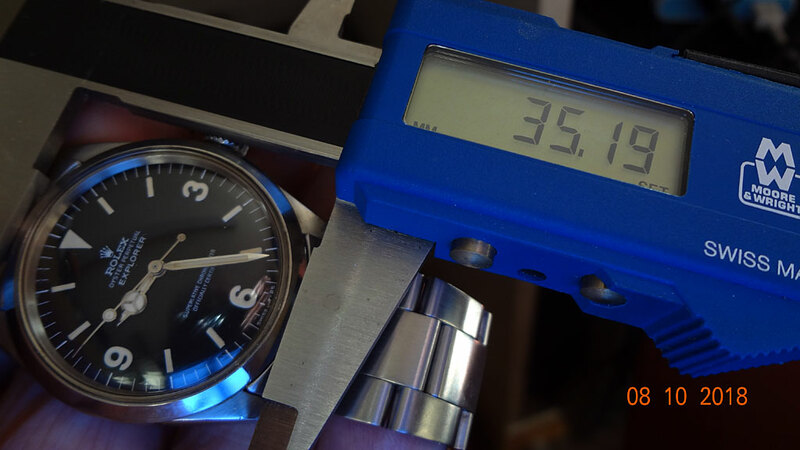 And given the extreme popularity and prices of this now vintage watch, many many many people do not feel that the 20mm lug width is out of proportion for the watch. But again beauty is in the eye of the beholder and if it looks wrong to you that's ok. I would be interested in the smaller size too. Please do the 35mm one Eddie, and get it out in time for Christmas!